Magnesium is the one mineral that is most likely deficient in animals because magnesium is lost during stresses and traumas, excessive exertions, inclement weather or travelling. We also have one of the lowest magnesium soils in the world in Australia. Therefore, grasses are high in sugars and low in magnesium. Magnesium chloride flakes are an ideal natural food supplement to compensate for what a horse may not be getting from diet. Magnesium drops even further after heavy rain and floods because it is highly water soluble and is easily washed away from surface soils. It takes time for earthworms to bring magnesium back up to plant roots from the lower soil strata (if available). In many areas the soil is so deficient it can’t even support sufficient earthworms… Organic farmers who treat their soils with mineral supplements including magnesium have a better chance at harvesting plants with higher levels of magnesium. Supplementing grazing paddocks with magnesium helps to provide the horse with better quality grazing, however, excessive stress levels can still overpower the value of nutrition in the higher nutrient feeds. Elektra Magnesium® Chloride Hexahydrate are natural salt flakes comprising magnesium chloride in a crystal complex of 6 water molecules (hexahydrate) plus 2% trace minerals. They are naturally evaporated food grade magnesium chloride salt flakes, with Australian laboratory trace mineral analysis down to 10ppb showing NO mercury and NO lead contaminants. They also contain the highest level of elemental magnesium (over 16%) of all the magnesium chlorides in the range (range = 12-16%). Magnesium chloride is the most soluble and bio-available form of magnesium, and requires no work to digest once it is dissolved in water. Cells can take it up immediately – even transdermally! Other magnesium compounds encounter digestive issues and are less bio-available. For example, magnesium oxide, a commonly used magnesium supplement, is only 4% bio-available, which means that most is expelled via the digestive system regardless of how magnesium deficient the horse may be. Suggested Feeding Methods – click here. 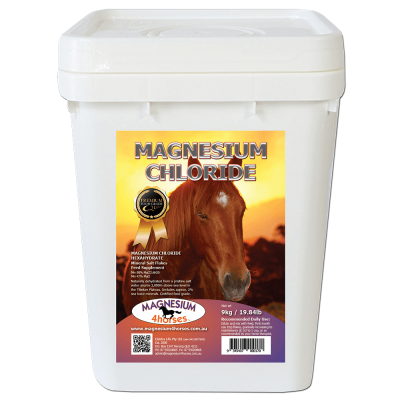 Note that some horses with acidosis may also need a form of toxin binder and/or pH treatment to optimise the benefits of magnesium. For more information about diet and nutritional balance you can consult with a horse therapist here. Flakes will draw moisture if exposed to air for too long. Keep air tight. I purchased a bucket of magnesium salt flakes some weeks ago and it arrived safely, thankyou. I have been giving my thoroughbred the appropriate dose and have noticed a big difference in his attitude and behaviour so thankyou for a great but simple product.